The follow-up to her critically acclaimed Lie to Me, J.T. Ellison's Tear Me Apart is the powerful story of a mother willing to do anything to protect her daughter even as their carefully constructed world unravels around them.One moment will change their lives forever...Competitive skier Mindy Wright is a superstar in the making until a spectacular downhill crash threatens not just her racing career but her life. During surgery, doctors discover she's suffering from a severe form of leukemia, and a stem cell transplant is her only hope. But when her parents are tested, a frightening truth emerges. Mindy is not their daughter.Who knows the answers?The race to save Mindy's life means unraveling years of lies. Was she accidentally switched at birth or is there something more sinister at play? 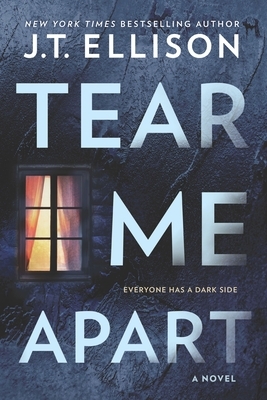 The search for the truth will tear a family apart...and someone is going to deadly extremes to protect the family's deepest secrets.With vivid movement through time, Tear Me Apart examines the impact layer after layer of lies and betrayal has on two families, the secrets they guard, and the desperate fight to hide the darkness within.